When bleary-eyed insomniacs gather around their morning coffee to discuss and share their non-sleeping woes, it is usually with sorrow and frustration. 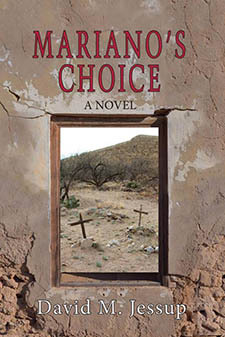 “Mariano’s Choice,” by David M. Jessup, will be released this coming Saturday, October 1. This book’s release will change the tone of those insomniac conversations and many others for quite a while, particularly for those of us who live in the areas Jessup so beautifully and accurately describes in this book. Well-written historical fiction, by its very nature, must walk a fine line between facts and artistic license about those facts. Jessup meticulously bases the story of a young man who felt like “the invisible son of a humble servant” upon fact while making history come alive. He does this throughout the story by introducing us to his characters in a way that makes us recognize ourselves and family and friends in these decades-gone people who actually created our history. This story of a multi-faceted man, culture and country deserves to be read without any introduction so I will not disclose any of the issues that are raised in the 1800s that are still just as pertinent at this moment in our own history. Insomniacs, rather than feeling sorry for ourselves for our lack of sleep, we can now feel blessed to have that uninterrupted time to absorb “Mariano’s Choice” and hopefully learn from people and cultures who have walked before us as well as enjoy a beautifully readable retelling of our Western history and heritage. 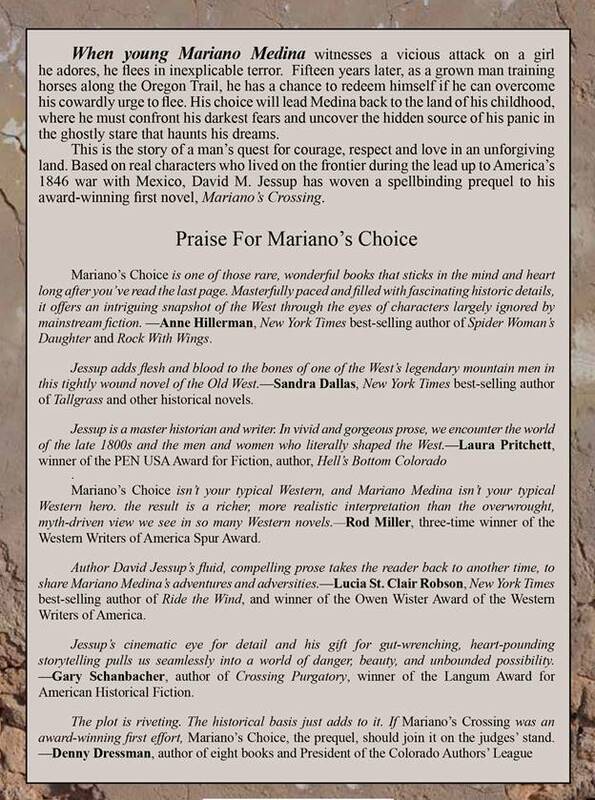 We have the advantage of a safe distance of over a century when we will surely analyze what choices and decisions we may have made if we had been in Mariano Medina’s boots. 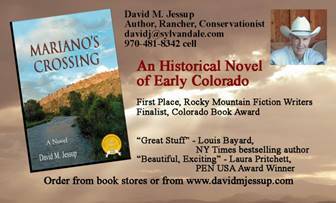 David Jessup has created my new favorite Western historical novel. His writing is enhanced even further by his own background and experience as a modern-day cowboy, rancher and agricultural leader. This just proves what I’ve always thought: Cowboys can do it all!